Defected return to ADE on 19 October with Claptone, Amine Edge & DANCE, Sam Divine and more for a daytime takeover at Stadspodium. 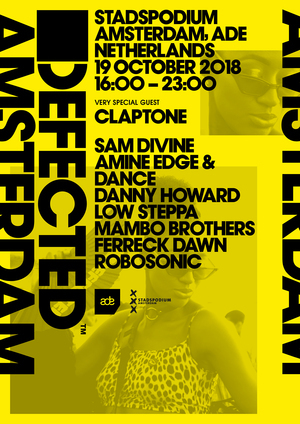 Returning to Amsterdam to throw the conference's annual Defected party, this time in a new daytime slot and at possibly one of Amsterdam's most unique venues, this party is one to consider for anyone making their way to the Amsterdam Dance Event. Attendees can expect non-stop feel good house music selected by residents and guests just back from Defected's 2018 Ibiza season and Defected Croatia festival, including Masquerade maestro Claptone. In addition, both new additions to the Defected crew, BBC Radio 1’s Danny Howard joins Ibiza's Mambo Brothers, aiming to drop those end-of-summer vibes. After appearing throughout the summer for Defected, Ferreck Dawn and Robosonic are possibly the ones to watch with their vocal and deep house infused sound, while fresh from a release on sub-label DFTD, French duo Amine Edge & DANCE will be laying down their mix of direct club sounds. Also, returning from their Defected Ibiza residencies, in-house radio presenter Sam Divine and Low Steppa aim to lay down some serious floor fillers. Taking place at Stadspodium, a 5,000-capacity club space with an ultramodern and futuristic stage area, the venue is located in the industrial zone of Turbinestraat in Amsterdam West.